Please welcome Marc Schwartz as he shares his review of 150 Central Park restaurant on Oasis of the Seas. My wife, Dianna, and I have been cruising since our honeymoon in 1981 and to date we have been on 9 cruises total, 5 on Royal Caribbean. We have also more recently come to enjoy specialty dining, which is at an extra cost over the main dining room on the ships, but provides for a superior experience, both in food and service. On Royal Caribbean’s Oasis class ships, there are multiple options to choose from and I offer my thoughts on one of them here. 150 Central Park (150), located on the Central Park area of the ships on Deck 8, is arguably the premiere specialty restaurant on the Oasis and the Allure and perhaps all of Royal Caribbean’s ships. The service charge for dinner at 150, as of this writing, is $40 per person (includes gratuities). There is an optional, 6-course dinner with wine pairing, for an additional $75 per person ($115 total per person, including gratuities). The atmosphere is upscale and dress is recommended to be semi-formal to formal. I would also strongly urge that you make pre-cruise reservations unless you are doing a specialty dining package, where you may have to wait until you are onboard the ship to make some of the reservations. On our Oasis and Allure cruises, we did the wine pairing both times and are not sorry that we did. The entire meal, from beginning to end was a wonderful experience with a selection of food and wines that was phenomenal. I would recommend planning at least two and a half to three hours for dinner, especially if you do the wine pairing, to give yourself sufficient time. Consider this if you have other after dinner plans, such as one of the ship’s shows, as you do not want to be rushed. During our first experience at 150 on the Oasis, we had planned to see the main theater show after dinner and only gave ourselves about two hours for dinner. Our server, Mladen, who is from Serbia, indicated that he could “speed things up for us”, but gently urged us to take our time to relax and enjoy the evening. I am glad that we elected to take his advice and see the show another day. We did not make the same scheduling mistake on the Allure. The dining experience starts with an optional, extra cost, Cucumber Martini. 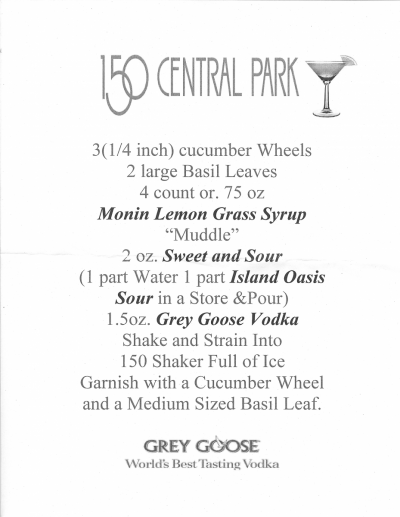 This is the signature drink at 150 and is only available there. I was hesitant at first, but had heard of the drink from friends before we sailed. It is a wonderful and refreshing pre-dinner palate cleanser, as the alcohol (Grey Goose Vodka) is very light. It would be too easy to have several of them, but save yourself for the wine. We liked them so much that we got the recipe from Mladen and now make them at home frequently. Dinner then proceeds with a selection of breads, fresh butter and a wonderful assortment of flavored salts. Your server will introduce you to each salt, its country of origin and of course the flavor. Butter your piece of bread and sprinkle one of the salts over the butter to experience the unique flavors and textures. You may find that you like some and not others. As dinner proceeded, each pour of wine was served just prior to the course it was to be paired with, as our server described the wine to us. Each bottle of wine was served using the Il Decantino decanting flask. We ended up buying one of the Royal Caribbean logoed Il Decantino units to take home with us and use it all the time with newly opened bottles of wine. From that point on, we slowly enjoyed each course and the paired wine. The presentations were very fresh and colorful, appealing to your visual senses, as much as they would ultimately take over your nose, tongue and taste buds, all of which are of course, biologically intertwined. The size of each course is very typical for today’s internationally influenced, fine dining experiences. Sufficient to provide you with a enjoyable experience of each, while not being so large that you would find yourself filled before reaching the end of the meal. While enough time has now passed that I cannot comment in detail on each course, I will say that each was wonderful and I have no recollection of any particular course that I did not care for. They were each quite unique and provide an opportunity to expand your culinary horizons. Our servers were not overbearing in their presence during the evening, but were exceptionally attentive and engaging. When time came for dessert, we took our time, enjoyed some coffee, an after dinner drink and of course, the dessert. If you have not already guessed, we would go to 150 Central Park again, without hesitation, on future cruises. Is it expensive? Of course, but it is a fine dining experience at sea that would compete with any similar land based experience. We paid $230 (at current pricing) for the two of us and some extra for an additional tip, for superior service. However, consider that a similar, land based, fine dining experience, with a wine pairing, would easily be over $400 for two, before a tip. If you are taking a future cruise on the Oasis or the Allure and are considering experiencing specialty dining, I would urge you to include 150 in your plans. It’s that good.